We’re less than a week away from Valentine’s Day! So, I’m doing a “Countdown to V-day” series of daily blogs to give you gift ideas. Looking back on what I’ve given my husband over the past several years we’ve been together, his most common gift has been lingerie. Yeah, it’s technically a gift for me… but let’s be real, this eye candy is DEFINITELY a gift to him. 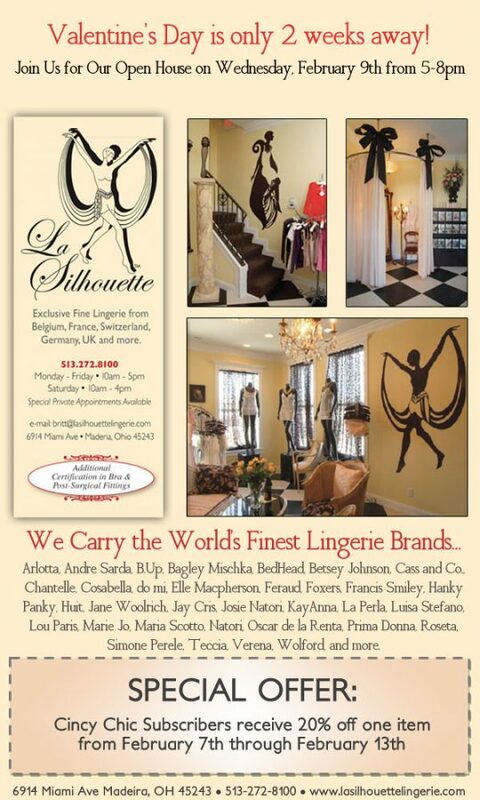 My favorite lingerie shop in Cincinnati is La Silhouette Lingerie in Madeira. I know I’ve written about her a million times (here and here on Cincy Chic and all these times on this blog), but I just adore feeling like I stepped off the streets of Paris into this beautiful boutique. Brit, the owner, will gift wrap the gift too. She always does such a good job. A class act all the way. She’s actually hosting an event tomorrow (Feb. 9) from 5-8pm at the boutique if you’d like to stop by, grab a cocktail and find something special for your someone special. I’ll be there!